A tentative link today to the Warbird Tails Bombers/Transports theme for the month of April. Earlier this week the Imperial War Museum announced a series of short flying displays taking place on “normal” weekends across the year, giving the chance to see some of Duxford’s incredible based machines in action all within the normal museum admission price. These events are known as Showcase Days and more details can be found here. The first of two events taking place in April saw Trainers and Transport take centre stage. 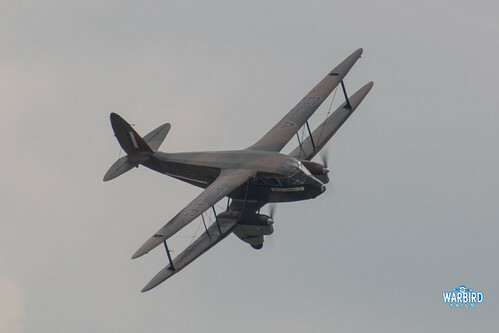 This saw a brief programme of four aircraft, with Mark Miller’s Dragon Rapide representing Transport and a DHC Chipmink and Slingsby Firefly filling the trainer role. 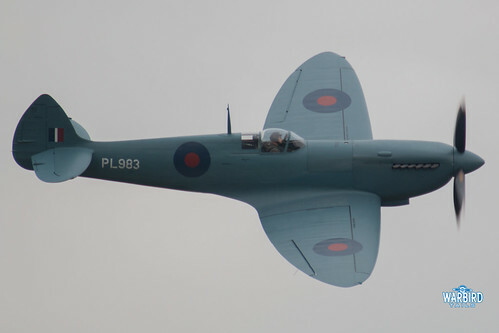 As a warbird bonus there was also a scheduled appearance from Mk XI Spitfire PL983 (known as “L”). As an unarmed PR example, I guess if any Spitfire was to fit tenuously into the transport theme, this was it. These events certainly set a great precedent and with the final event of the year planned for 20th October, they provide an always welcome extension to the traditional airshow season. I don’t think anyone had told the weather to pick up though as it was a firm reminder why we generally wait for warmer months before standing outside watching airshows! Think I’ve thawed out now! A graceful pairs performance from the de Havilland Contingent opened the short flying display in challenging gusty conditions. 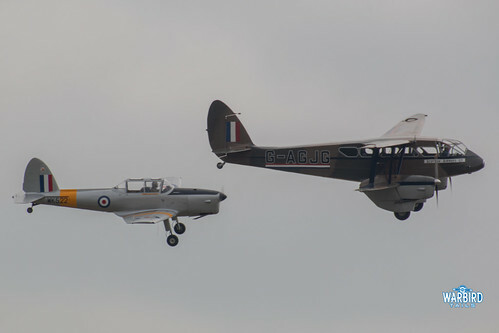 It was great to see the Rapide flying with the Chipmunk and each broke off into short solo displays before landing. 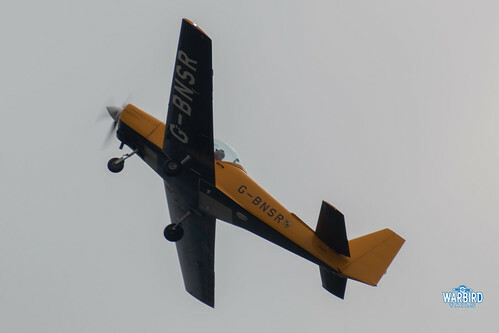 Following the de Havillands was a spirited aerobatic solo from the Slingsby Firefly. 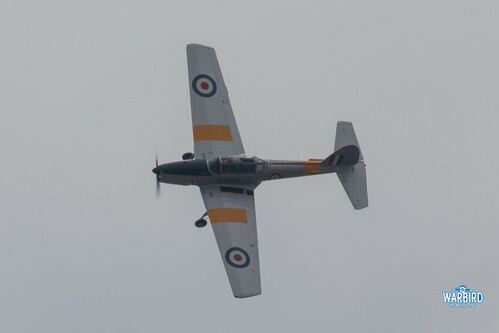 The Firefly is one type that seemed to be everywhere during early airshow memories but has been rarely seen, by me at least, in recent years. This performance was a great low level account of flowing aerobatics combined with sweeping passes and made a nice change to see a once familiar sight back in the skies. Bringing the short flying display to a spectacular conclusion was what is fast becoming one of those iconic airshow pairings, John Romain and “L”. Running in over the American Hangar, the Spitfire was put through a typically graceful routine effortlessly combining graceful vertical and rolling figures all while staying right in front of the crowd. 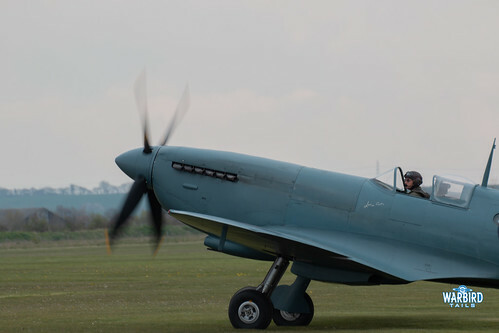 Having grown used to solo performances from John in the Mk I Spitfires in recent years, seeing him behind a more potent example is a great treat and to experience such a routine early in the year was a nice bonus. That wrapped up proceedings for the first of these showcase days. They seem like a great idea and provide a brilliant excuse to head up to Duxford (not that you need one). Next time sees the public display debut of the North American Yale and a Spitfire and Hurricane pair, amongst other acts. 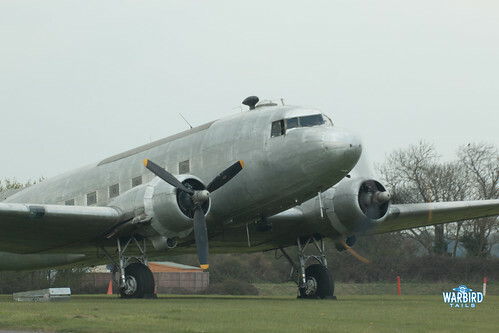 Finally, in order to keep things a little more on message for this month, above is a shot of Aces High’s C-47 performing an engine run at North Weald caught on the way home this afternoon. It certainly looks unique stripped back to bare metal. Presumably a new paint scheme is due ahead of “Daks Over Normandy” in June.